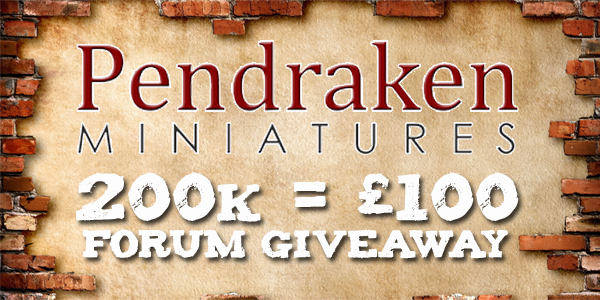 We had a similar competition when we hit 100,000 posts on the Forum, so as we approach our 200,000th post it's time for another giveaway! 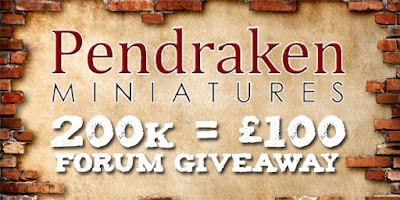 The rules are simple, whoever can guess the day and hour of our 200,000th post will win a massive £100 worth of Pendraken goodies! Simply state the day and hour you think we will hit this milestone, for example 7th May 19:00 and we'll see who can get the closest! In addition, we'll give a smaller £10 prize to the two people either side of the winner. The Forum has continued to grow every year thanks to you lot so it's nice to give something back. - You must have AT LEAST 25 posts to your name - If you're new to the forum, just join in some of the discussions, or post up some WIP pictures and batreps. - Guesses should be to THE NEAREST HOUR please - For example, 7th May, 19:00. If the 200,000th post is made at any point between 18:31pm and 19:29pm, then you're the winner, and so on. All times are assumed to be GMT. - The competition will close to entries when we reach 199,500 posts - So no waiting until the last minute to enter your guess! - No cheating to bump the post count closer to your entry! - Make sure all your posts are contributing to a thread/discussion/Totty. Anyone making one word posts purely designed to bump the count will have their posts deleted. Remember that this is a bit of fun, so let's keep it that way. Let us know if there are any questions on that lot. .. and then 2567 currently in April. So, get your calculators out, stick a pin in the calendar and post up your guesses!